It feels great to write a post announcing a new product or promotion for your store. However, it can be disappointing when your hard work in doing so doesn’t translate into sales. 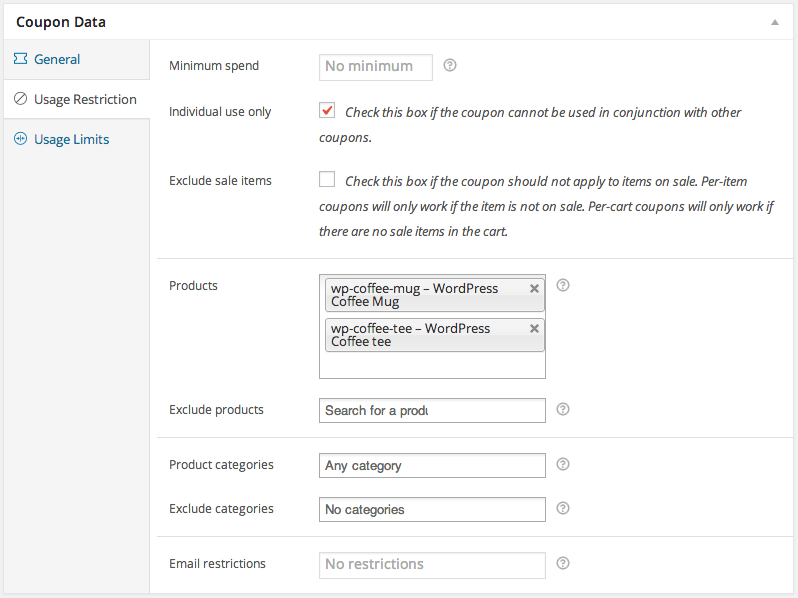 Fortunately, there’s a simple way to let WooCommerce automatically apply coupons for your readers, and even pre-fill their carts to reduce friction when purchasing your new product(s). This can help turn those blog readers into purchasers! The only thing you’ll need to complete this tutorial is the URL coupons extension for WooCommerce, which is $49. We’ll assume you already have your products set up and ready to purchase 🙂 . The first step is to write the post (or create a page) to announce your store’s new products, a sale, or whatever you’d like to offer a coupon for reading. 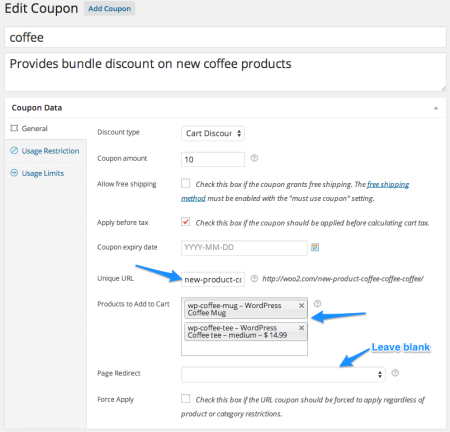 When your readers visit the URL of this blog post or page, they’ll automatically have the coupon applied and you can add products to the cart as well. This can be really handy when you announce a product, as customers can just jump straight to the checkout with their purchases and a discount in hand. When you use a URL coupon, customers won’t even need to enter a coupon code – the discount is automatically applied because they’ve visited this URL. Note that if you don’t add any products to the cart with the coupon, then the discount will not be applied – something must be in the cart for this to be added. 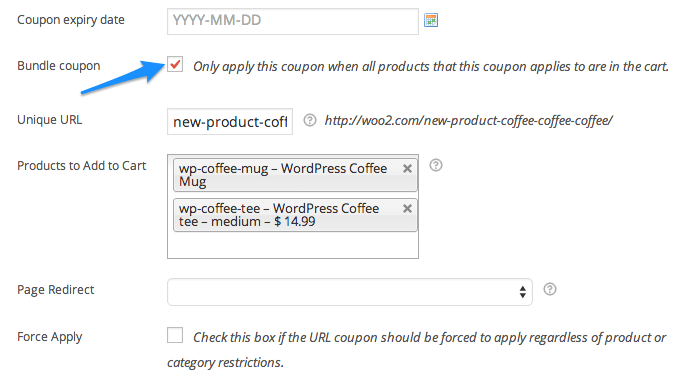 You could also use the [products sku="wp-coffee-tee"] to display a single product (here are more product shortcodes). The ID or SKU attribute can be used to identify the product if you’d like to include it in your post, though this isn’t required for the tutorial to work. The final step you’ll want to take is to include a notice somewhere in the post that you’ve automatically applied a coupon and added these new products to the cart just to say “Thanks for reading”. You could also include a link to your cart page (usually mystore.com/cart/) to make it very easy for customers to go buy your new products. 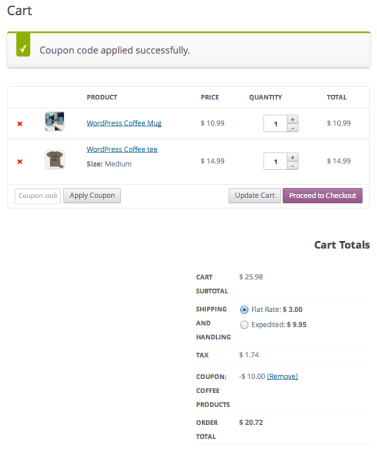 Now that your post is ready to go, grab the URL for the post and head over to WooCommerce > Coupons. You can create your coupon name, discount type and amount, and other options. When you get to the Unique URL, use the URL for the post that should apply this coupon (everything after the .com/). You can also select which products should be added to the cart (or which variations of that product). When you get to the “Page Redirect”, leave this blank, as we don’t want to send customers elsewhere until they’ve read the post. You can also set restrictions for your coupons. This will ensure that one of the new products is in the cart for the coupon to apply. 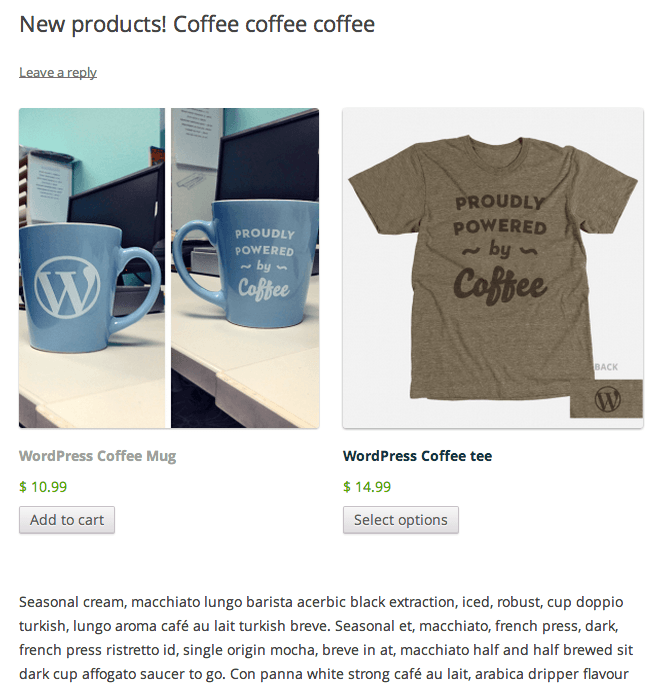 I’ll select my “WordPress Mug” product, and the parent of my “WordPress Coffee Tee” product. Using the parent product ensures that the coupon will apply for any variation of that product. Once you’re finished with all coupon options, you can save your new coupon and test it out! Visit your blog post, then go to the cart page. You’ll see your products added to the cart and your discount applied. There’s one final thing you can do for your coupon setup. Let’s pretend that I only want the coupon to be applied if both new products are present in the cart. There’s a free plugin I can use to do this called WooCommerce Bundle Style Coupons. If you install and activate this plugin, a new option will be added to your coupons to treat them as a “bundle”. This will require all products for which the coupon is restricted to be in the cart for the coupon to apply. 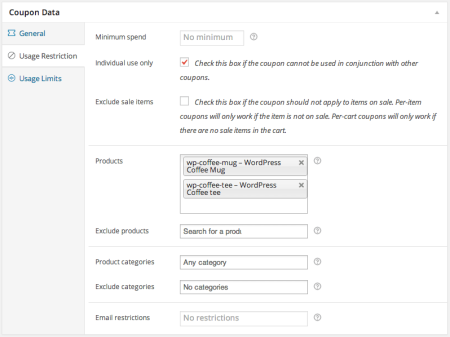 In our case, since we’ve restricted the coupon to the WordPress Mug and Coffee Tee, the cart must contain the mug and some variation of the tee shirt to be applied. If the customer removes either from the cart, the coupon will be removed. Now we’re done! 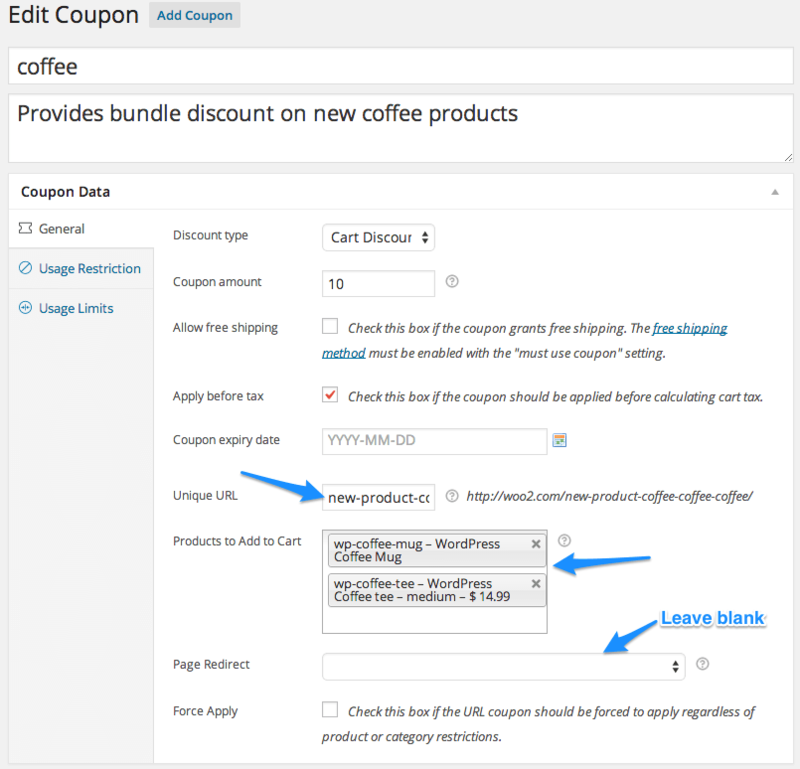 Let WooCommerce automatically apply coupons for your blog readers to reward them for keeping tabs on your shop. If you do use this trick, we’d love to hear about it in the comments! That’s really great! I will apply this on my WooCommerce store for upcoming event of Christmas.